Love when food trends follow fashion trends. How adorable is this chevron pattern on a traditional jelly roll. I credit Pinterest with popularizing food that is so darn cute in the everyday households. It’s fun to watch all the adorable treats popping up on social media. And wouldn’t this be great on an Easter brunch table? 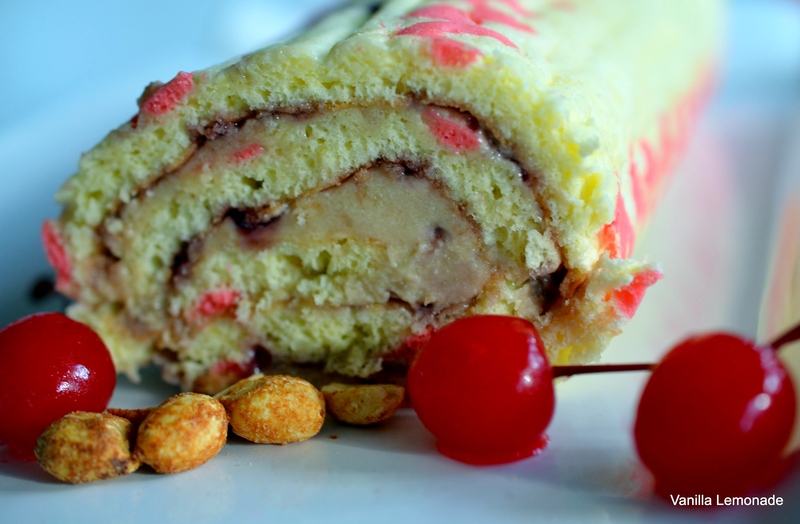 I loved the idea of honoring the 1850s jelly roll then with classic flavors of peanut butter and jelly. In a medium mixing bowl, whip the eggs until frothy. Slowly add sugar, water, vanilla and flour mixture, scraping bowl occasionally. Take out about 1/4 of the batter and add a few drops of food color to get to the desired color. Place the colored batter into a piping bag with a small flat tip and make the zig zag pattern onto the wax paper. You can find patterns on line to print out and trace, or make your own with a sharpie marker on a piece of parchment paper placed under the wax paper. Bake the patterned batter for 2 minutes; allow cooling for 3 minutes and then spreading the rest of the batter on top. Bake another 9-11 minutes. Immediately loosen the cake around the edges and invert cake onto prepared towel. Carefully remove paper. Roll the cake, beginning at the narrow end. Cool on a wire rack for 45 minutes. Add cream cheese, powdered sugar, peanut butter and almond extract to a medium bowl and beat until well mixed. 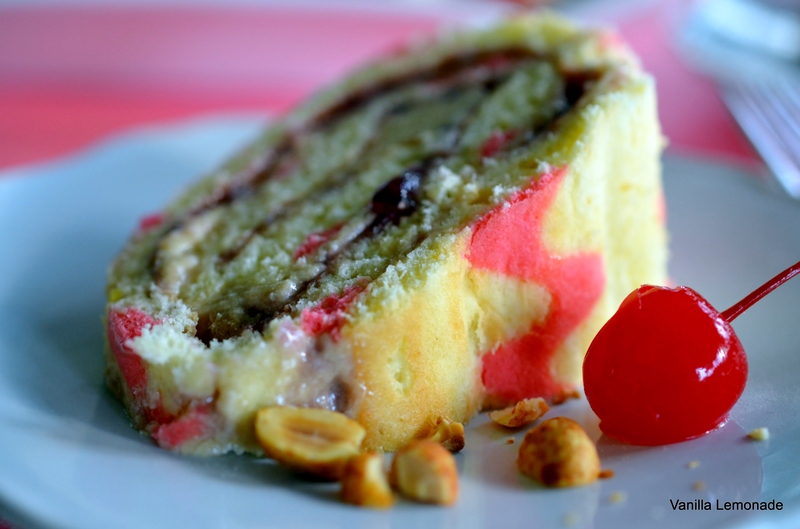 Carefully unroll cake and spread the peanut butter cream evenly to edges. Follow by spreading the fruit jelly over peanut butter. Gently roll the cake and wrap in plastic wrap; refrigerate at least 3 hours before serving. Slice and serve with fresh fruit or berries. 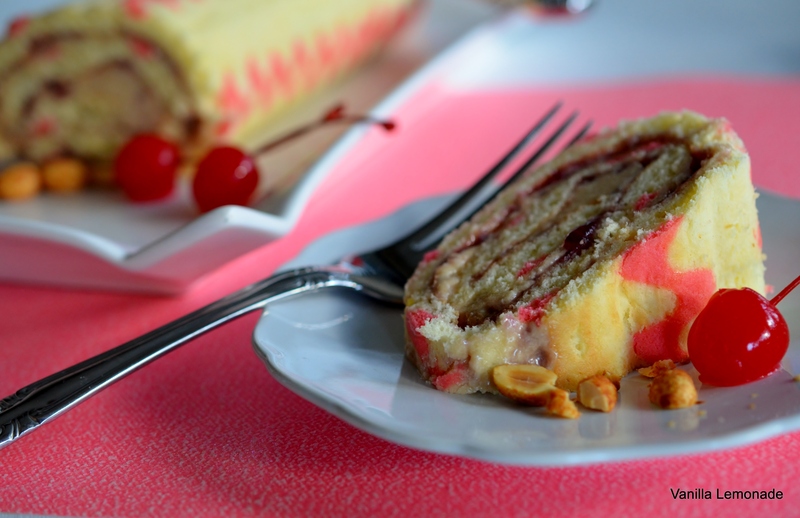 This is such a fun, playful way to present a jelly roll cake. The peanut butter and jelly filling is going to take you back to the lunchroom table, where everything is cute as a polka dot and sweet as a sprinkle! Let your inner child and fashionista meet in the kitchen! 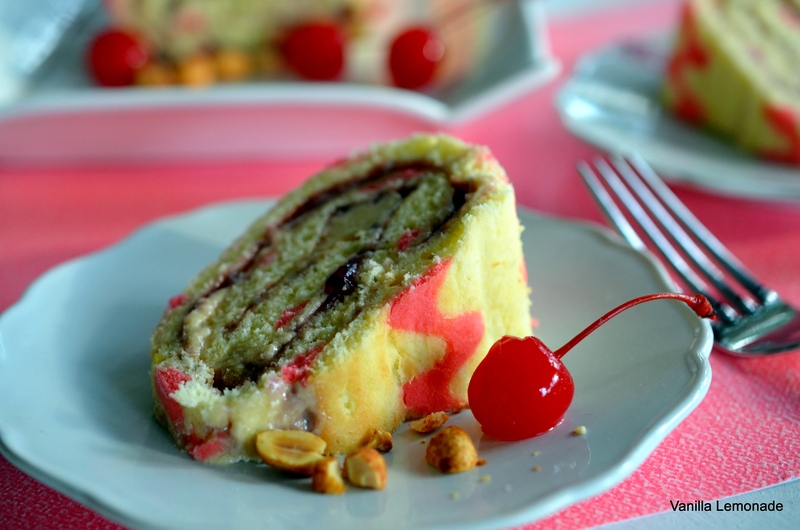 This entry was posted in Cakes, Desserts, Holidays, Jelly Roll, Recipes and tagged Chevron Cake, Jelly Roll, Peanut butter and Jelly Cake. Bookmark the permalink.